Savages 2.0: Are Gangs and Terrorists the New Indian Stereotype? If you’re going to stay current, sometimes you have to re-invent your brand, and we Indians are no exception. Luckily, we have people lining up to do it for us. We begin with the apparently oh-so-nascent Indigenous Resistance Army — IRA, for short — which, according to a recent speech by the chair of Defence Management Studies at Queen’s University, Douglas Bland, is somehow this close to spontaneously forming on reserves throughout the country. But wait — there’s more. Cue the theme from your favorite Western. It’s time to circle the wagons. I apologize if any of this could be construed as making light of the very real problems and pain gangs cause for Aboriginal communities. But, honestly, I have to wonder about what is really motivating this expression of concern over young Aboriginal men among mainstream commentators. I wonder too whether it doesn’t ultimately serve to demonize young Aboriginal men as a whole, a long-standing tactic that has historically justified all sorts of attacks against them as part of a pretext for taking indigenous lands. 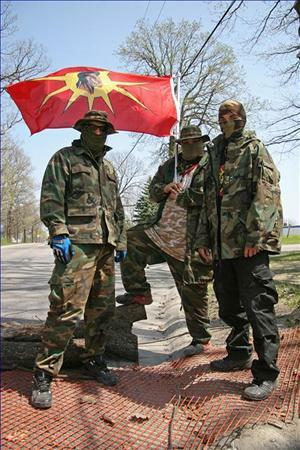 Now, forgive my foggy memory here, but weren’t some of the most memorable militaristic actions involving Aboriginal communities in recent history carried out not by gangs or indigenous militants but by Canadian police forces and even the army at Oka, Gustafsen Lake and Ipperwash? Now, it’s true that protests preceded (some might argue precipitated) these martial interventions, but last time I checked the right to assemble in protest — especially when you feel that the law upholding Aboriginal land rights has been fundamentally violated — is as available to Aboriginal peoples as anyone else in Canuckistan. So, hey, can the non-Indian-experts-about-Indians just please make up their minds as to what Indians are supposed to be? I mean, to hear some tell it, Aboriginal peoples are constantly either sick (alcoholism, AIDS, diabetes, FASD, etc), uneducated, having too many babies too young, or all of the above. But now we’re hearing that, far from being incapacitated by our illness/impoverishment, we’re all set to steal the country back, be it through armed revolution or organized criminality. In some ways, it feels like those two age-old myths about Indians have simply adopted new garb: the one myth that says we’re all violent savages, the other claiming Aboriginal peoples are all but disappearing as a ‘race.’ Yet, somehow, we Indians just insist on surviving despite others’ best efforts. And, for some, that survival instinct leads to gangs, or even to harbouring thoughts and plots of insurrection against the Canadian state. Those questioning such paths should also question what the alternatives are, although we should add here that what is perhaps understandable can be unacceptable at the same time. But, theories like Mr. Bland’s aside, perhaps all we Indians really want is to update our image: after all, even savages have to move with the times, or then we really could disappear. Where is Jimmy Stewart when you need him? My computer began to play a sound the moment I opened this post – the “Red Alert” sound from Star Trek (r). Coincidence? Hmmmm….